I am so proud of myself. I actually sewed jersey fabric, well officially it is called "Tactel" fabric, but essentially it is a knit fabric and therefore comes under the same group heading. The fabric is stretchy and therefore needs different techniques for sewing. Before I started sewing with my Tactel fabric, I consulted my oracles of all things stitchy, Mary Clare and Linda. I was told to use a special jersey needle on my sewing machine, which has a ball point so it slides through the knitted stitches rather than piercing the threads. I also picked up a tip from the internet that I should either use a long straight stitch or a zig zag stitch to allow for the stretching of the fabric. I used the zig zag, and it seemed to work really well. The fabric I bought was from Tia Knight through her eBay shop. I have bought jersey fabric from her before, but I haven't actually sewed with it. This time I bought the Tactel I used for the project and some light purple cotton jersey. There was reason for this purchase, as I had been invited to a Hallowe'en Party with the theme of animation and cartoon. I had decided to go as Daphne from Scooby Doo. I bought a dress pattern that I thought I could alter to make roughly this style and I thought I was sorted. Then family obligations meant that I couldn't go to the party so I decided to make the dress without the stripes and just follow the pattern I had bought, because comfortable and reasonably smart dresses are always useful. The pattern I bought was Simplicity 2766 and I felt like I got a real bargain with this pattern. This pattern has a dress, tunic, skirt, trousers, a jacket and a coat pattern all included. 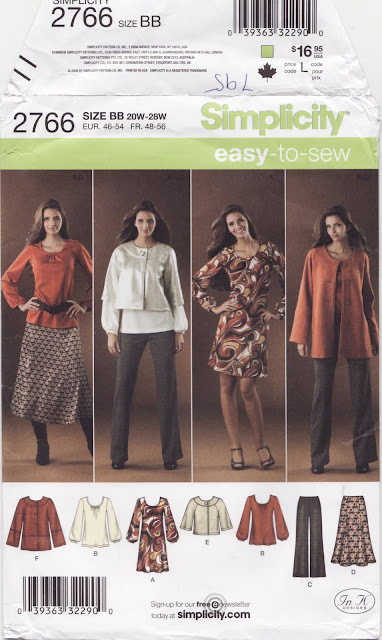 You will note that it also says "Easy Sew" which is just what I need, as I am still a very beginning type of sewist. I think I will definitely use the dress part again, along with the tunic, trousers and skirt. They are classic cuts and will be useful for years. The dress is marked as "A" on the pattern above and I love the shape. In order to preserve the paper pattern I used a new product I had not seen before, made by Prym, Plastic Tracing Sheets. These are large plastic sheets that come with a pen to trace your pattern. This way you preserve the pattern and get a more robust pattern piece to pin to your fabric and cut out. I can definitely recommend these sheets and will buy them again. I am always terrified of ripping my pattern pieces or not being able to make something in a different size, once I have cut something out. I am glad in this instance that I didn't cut out the paper pattern as I think I will be adjusting the pieces for the next time I make this pattern. I am lucky to have an hourglass figure, however, the shape is not in the prescribed proportions that our lovely UK sizing would have us all be. My waist is quite narrow compared to my bust and hips, and my bust is proportionately larger than my back. When I cut out the pattern pieces according to my bust size, my waist got lost in the fabric. To bring it out of hiding again, I used some of my left over fabric to fashion a long tie belt, which I am pretty happy with. I think that I would make the dress a little shorter next time. I would also blend the sizes from the bust down to the waist and out to the hips again. Then the belt would not be necessary. The above picture isn't the best photo, but I am really pleased with my first attempt at doing gathers on both the front neckline and the bottom of the sleeves. I really love the shape of the sleeves. This dress will be very useful and great for days when I have to travel or sit upright for any length of time. It won't press on my tender tummy on days when it is swollen and sore. It is also quite smart so I will be able to wear it on nights out, when I am unable to lean back very much, for example in restaurants or bars. I am very proud of my very first stretch fabric dress, and I intend to make at least one more this season so I can work on the fitting. I have some great jersey fabric in black with white polka dots which I think would be quite funky, even though I had intended to use that for another pattern I bought. Time will tell which version gets made. In the meantime I will enjoy this new addition to my wardrobe. By the way, what do you think of the radical new colour of my hair? I decided that as I don't have to go to a formal office the way I did before I was ill, it was time to try something a little more fun. Have you noticed it is the same colour as our floor? I hadn't, until I looked at the photo - I think it may be a trick of the light!